PORT AU PRINCE, Haiti (CMC) – A judge who has issued an arrest warrant for former president Jean Bertrand Aristide says he expects the police to bring the former head of state before him by force if necessary. Lawyers representing Aristide have filed a motion seeking to have investigating judge Lamarre Bélizaire removed on the grounds of bias. But the judge told the Port au Prince based news website, Haitian-Caribbean News Network (HCNN) that he had not revoked the warrant in light of the motion filed the former president. “I issued an arrest warrant for Mr Aristide and I don’t know what takes the police so long to bring him before me, because they know where he is,” Belizaire said, adding “I heard rumours that I had waived the arrest warrant. “I want to say that it is absolutely false. The warrant still holds and I am still the judge in charge of the inquiry and nothing has changed in that regard,” he said, that he would continue his work in conformity with existing laws, without any form of abuse. “I don’t have any particular problem with anybody. I am a judge and I am only doing what the law requires me to do and that is all I can say for now,” Belizaire added. 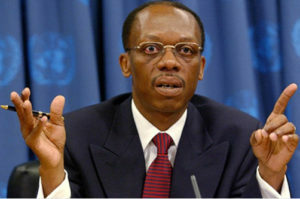 Aristide and several of his former colleagues have been accused of embezzling hundreds of millions of dollars from the State through his organisation, Aristide for Democracy Foundation and other organisations during the period 2001-04. Aristide, a former Roman Catholic priest, and his colleagues including Mirlande Liberus, Yvon Neptune, Jean Nesty Lucien and Gustave Faubert, have also been banned from leaving the country. The Dean of Port Au Prince first instance court, Raymond Jean-Michel, confirmed Tuesday that he had received a copy of a motion seeking recusal and disqualification of Justice Bélizaire on the grounds of bias. Aristide’s lawyers said their client did not receive the summons which was sent to his residence, but the judge believed he deliberately chose not to appear. Aristide’s lawyers argue that the judge is now obligated to stop all proceedings in the case regarding serious acts of corruption blamed on the former leader, but legal observers say the arrest warrant against Aristide is still valid and that the judge may proceed with the criminal inquiry while relevant judicial authorities examine the request for recusal. Supporters of the former president have been gathering near his home in the Tabarre district, in a show of support for the former leader, who spent seven years in exile in South Africa before returning to the country in 2011. “The government of President Martelly and Prime Minister (Laurent) Lamothe is doing nothing to solve the problems and meet the needs of the population,” he said.